Song of the Dirigible begins with the sighting of a gray, German dirigible among other airplanes in the sky. The dirigible lands in the city of Moscow, where a gathered crowd of thousands awaits. A German chef then emerges from the airship and opens his arms to the friendly crowd. Above the noise of the crowd, a voice proclaims that someday the Soviet citizens, themselves, will build their own, better airship. Once the dirigible is ready to leave, the crowd bids farewell to the visitors as the airship flies away. 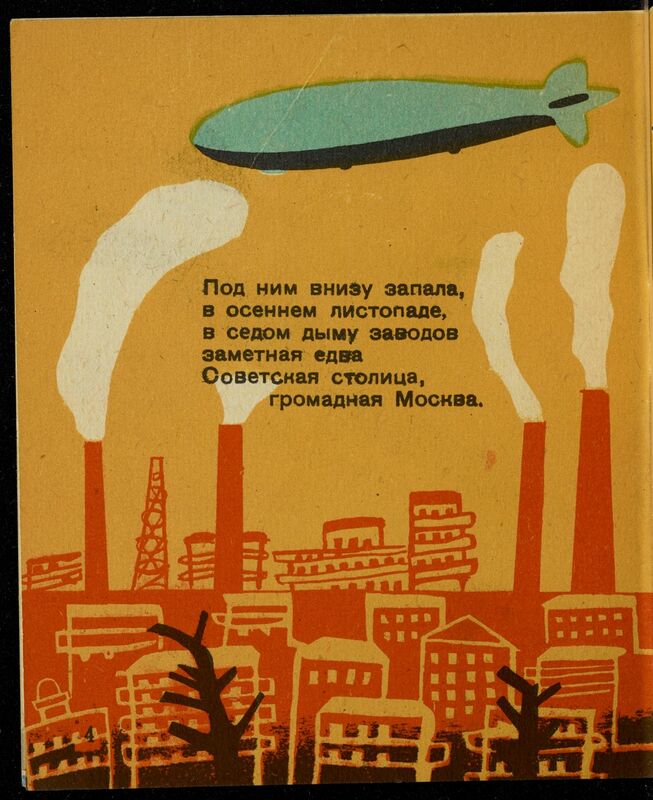 The final page of the book reveals an all-red Soviet airship as the embodiment of the collective Soviet dream of building their own, “best” dirigible. This book illustrates the confluence of two key events of the time: Joseph Stalin’s first Five-Year Plan and the 1931 trip of the German dirigible called the Graf Zeppelin. By the beginning of the 1930s, the Five Year Plan (1928-1932) was well underway, with the Soviet government aiming to rapidly speed the growth of industry and technology in the USSR to meet and exceed the West. In the years preceding, the USSR had relied heavily upon foreign goods and resources. For example, authorities had depended on Germany for supplying aluminum to build aircraft and officers that could teach at Soviet air training schools. By the end of the decade, however, the Soviet military had made significant progress with its air fleet, although airships remained a major weakness. Later, authorities became more interested in improvements in airship construction and development since they were proven to be extremely useful for long-distance flying and polar exploration (McCannon). This interest in polar exploration coincided with the 1931 flight of a German dirigible, the LZ 127 Graf Zeppelin. This flight was an international collaboration to map the geography of and measure the earth’s magnetic field and air quality in the relatively unexplored Arctic. German, Soviet, American, and Swedish scientists and explorers participated in this expedition. The trip began in July 1931, with the airship stopping in Leningrad and in the Soviet Arctic on its way to the North Pole (“Graf Zeppelin”). Dirigibles make other appearances in Nina Sakonskaia’s work, seemingly to function as a symbol of industrialization and progress, including Mom’s Bridge and Review of Homemade Toys. But it is most centrally in Song of the Dirigible that the author celebrates a central aspiration of the first Five-Year Plan -- the collective Soviet ambition for industrial progress. "Graf Zeppelin’s Arctic Flight, 1931." Airships.net, www.airships.net/lz127-graf-zeppelin/polar-flight/. Accessed 4 May 2017. McCannon, John. "Sharing the Northern Skies: German-Soviet Scientific Cooperation and the 1931 Flight of the 'Graf Zeppelin' to the Soviet Artic." Russian History, vol. 30, no. 4, Winter 2003, pp. 403-31.